Every week the Afghanis bring the Bazaar onto compounds all across Afghanistan. They sell everything at these bazaars. Cheap electronics from Pakistan and China. Bootleg DVDs. Carpets and tapestries from Tabriz, Konduz, Herat, Chagcharan, Mazr-e Sherif and other places. Jewels and Jewelry. Lapis Lauzuli rocks and sculptures. Wooden jewelry boxes. Knives and swords and muskets and rifles as well. You can even purchase a burqa for a souvineer, if you please. Most of the times that I cruise down to the bazaar, I’ll bring some candy or pastries from the Dining Facility. There are always young kids at the bazaars. They accompany their Fathers and Uncles. Learning the family trade. Down in Kabul, you’ll actually see women and some young girls at the bazaar. It’s rare, though. The young fellow in the video is from Herat. He and his father make the rounds of bazaar day at the various camps. I recorded this video at the Italian ISAF in Herat. It was my first time at this particular camp. We had stopped there so the PMTs could make some coordinations with the Italian Caribinieri (Police). I walked up to their bazaar and waved to the little bubba. I’d recognized him from the bazaar at Camp Stone. He waved back and I continued on to see if the bootleg DVD stall had a good copy of 10,000 BC yet. They didn’t. So they asked me if I wanted to buy a rug instead. lol I know. Strange logic. When I was able to escape, I made my way around the bazaar. I walked over to the kids table and started to play with knives and brass knuckles. When I walked up to look at the knives, he was singing. So I decided to try to capture him on video. As soon as I pulled out my phone, he stopped. Just smiled shyly at me. I couldn’t get him to resume for nothing. I even tried to bribe him. But all he would do was smile or laugh. It was pretty funny. Cute kid. Always smiling. I still haven’t been able to get a good copy of 10,000 BC. 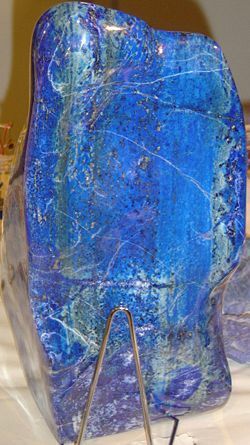 Lapis lazuli (sometimes abbreviated to lapis) is a semi-precious stone prized since antiquity for its intense blue color. Lapis lazuli has been mined in the Badakhshan province of Afghanistan for 6,500 years, and trade in the stone is ancient enough for lapis jewelry to have been found at Predynastic Egyptian sites, and lapis beads at neolithic burials in Mehrgarh, the Caucasus, and even as far from Afghanistan as Mauritania. Lapis lazuli is a rock, not a mineral: whereas a mineral has only one constituent, lapis lazuli is formed from more than one mineral. This is a cute video!